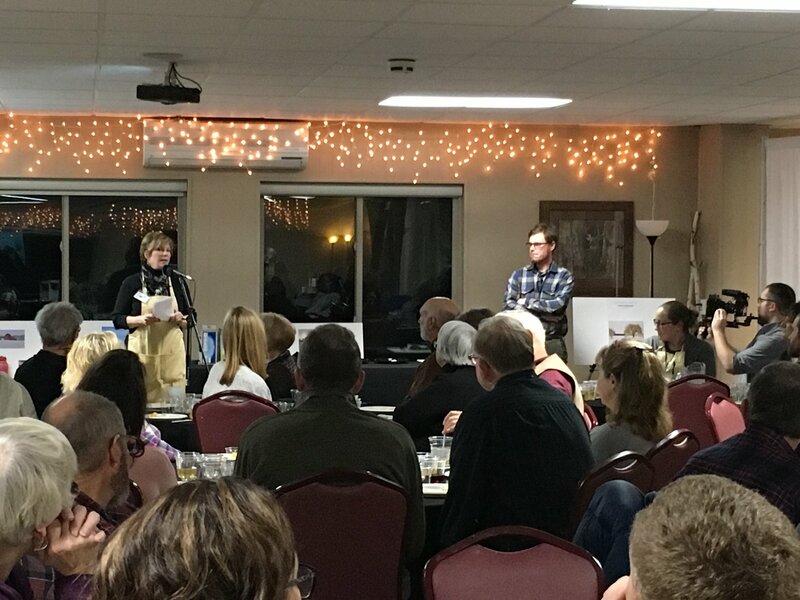 Farm to Fork Alcona's Judy MacNeill introduced the evening reception talk by Adam Beckta on pairing Michigan wine and cheeses. Keynote speaker Doug Paulus spoke first after breakfast. 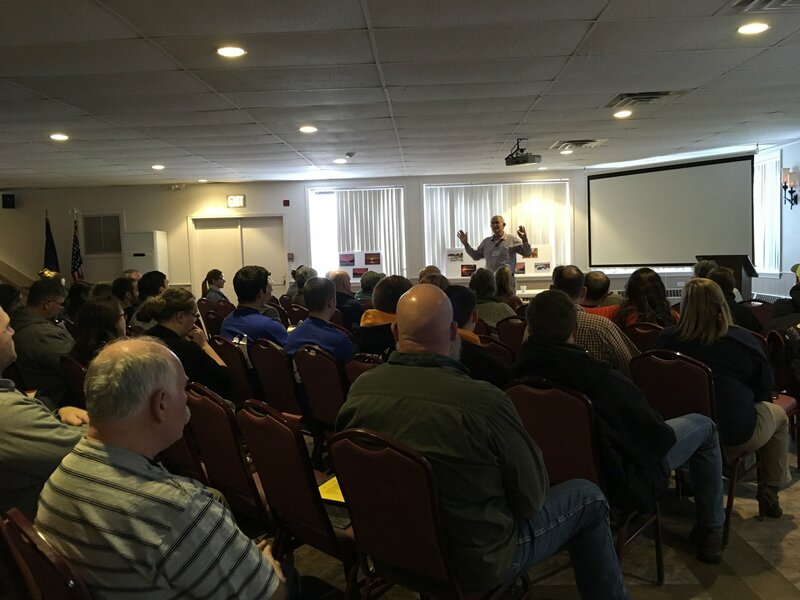 The audience for the farm conference filled the auditorium at Lost Lake Woods Club. Connor Hubbard, agricultural science teacher and FFA sponsor at Alcona High School, brought several students to the conference. 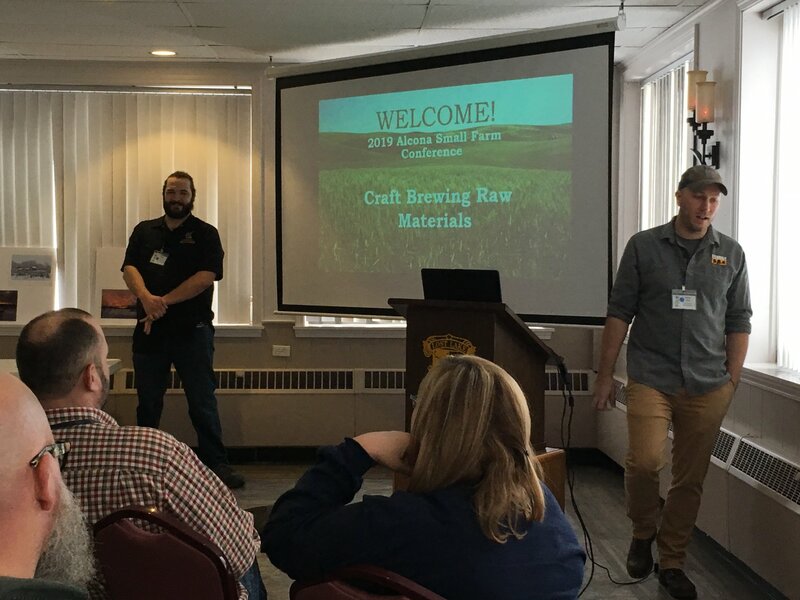 Eric Protiva, left, and Drew Rice led a sesson on microbrewing beer. ‍Doug Paulus is a third-generation farmer from Onaway. He uses his experience in business and farming in his position as director of Northern Market, which is under development in Grayling. It is his vision that the market will connect farmers, restaurateurs and the public to foods produced within a 100-mile radius. Northern Market will include spaces and equipment for rent to allow local entrepreneurs to offer eggs, honey and other kitchen-based products for retail sales. Tricia Phelps serves as chief executive officer of Taste the Local Difference, Michigan’s local food marketing agency. She has been promoting the local food movement in many capacities since 2004. She has been with TLD since 2014 and helped develop its operations in the Upper Peninsula and Northeastern Michigan. She believes in strong partnerships between farmers, community organizations and customers looking for ways to include local, seasonal, healthy foods into their diets. ‍Drew Rice and Eric Protiva are experienced brewers from Michigan. Drew is a lead brewer for Bell’s Brewery, located in Kalamazoo and Comstock. Eric is currently developing the microbrewery in Harrisville, Alcona Brew Haus. They know how to brew and market beer for a successful microbrewery. ‍Lorrie White and Phil Irwin are with Nifty Hoops in Ann Arbor. Nifty Hoops, which works to make hoop houses more affordable, easier to install and more valuable for vegetable growers, was born out of farm and food system community activism in southeast Michigan. Nifty Hoops hosts the Nifty Con each winter to bring local farmers together for support and information. They will speak about using hoop houses to your maximum advantage and about options for funding. Adam and Madeline Beckta are co-owners of Wandering Winds Farm in Spruce. They came to farming after many years working in the food and beverage industry.They purchased their 80-acre farm in Alcona County in 2015 and it is certified by the Michigan Agriculture Environment Assurance Program. They sell their mushrooms, produce, flowers and value-added products such as baked goods (carrot cake!) and jams at their farm stand and at local farmers markets. They also give workshops on cooking local foods at local events. 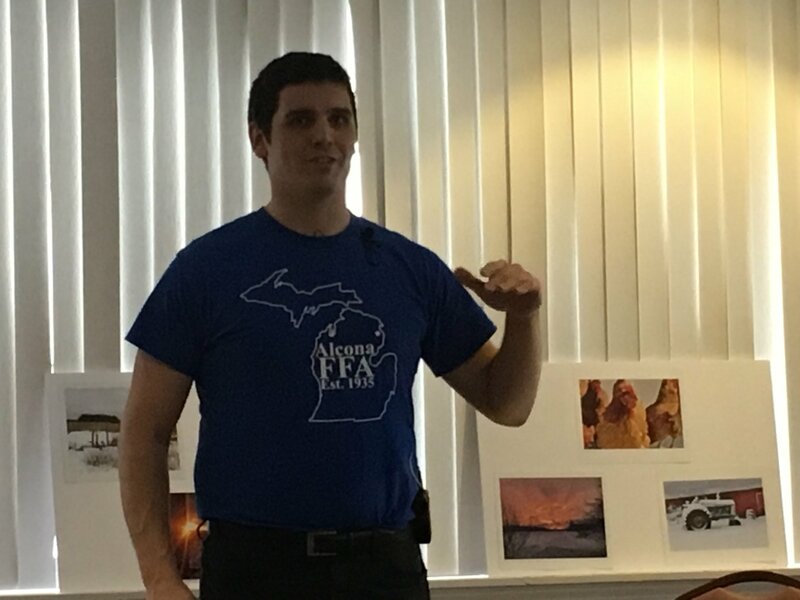 Adam is also presenting Michigan cheeses and wines at the opening reception of this conference on Friday evening. Corey Standen and his family purchased their farm, Standen Acres, in Lachine in 2014. They sell pasture-raised heritage-breed pork. Corey uses Facebook to promote and market his products. He illustrates the farm’s stewardship of the land as well as the natural and humane methods used in raising the pigs. Without resorting to negative advertising, he is able to make a compelling comparison between industrial pork production and his approach. You know that pigs that get belly rubs have to be content! ‍Brian Bates and his wife, Anne, began Bear Creek Organic Farm in 2012. Anne and Brian dream of a sustainable future, where the arts, education and organically grown food enrich their community. Bear Creek Organic Farm is Petoskey's first-ever 100% USDA Certified Organic Farm. At their 75-acre farm and through their network of retailers they sell everything from calendars to cabbages, honey to holiday cards, T-shirts to tarragon! In 2017 they were named the Petoskey Regional Chamber of Commerce Entrepreneurs of the Year. Wendy Wieland is an MSU Extension program instructor serving Northern Lower Michigan in community food systems as a part of the Greening Michigan Institute. Since joining Extension in 2001, Wendy has worked to rebuild a more sustainable food system. She works with entrepreneurs through her role as an innovation counselor for the MSU Product Center. She is a founding member of the Local Food Alliance of Northern Michigan and a longtime contributor to the Food and Farming Network. She serves on the Northern Michigan Small Farm Conference planning committee.